It's hard to write a review of a Mattel product and not speak of the many, many, many ways Mattel has screwed over toy collectors, but by now it's old hat to even bring it up. Mattel is evil like Satan is evil...you don't have to keep talking about it, everyone knows the devil is the devil, and everyone knows Mattel will be Mattel. What keeps them afloat is that we as a community keep buying their figures, and the reason that happens is twofold: Mattel manages to get great licenses, and they have some of the best sculptors in the business (the Four Horsemen... God help us all if they ever get Kyle "Tankman" Windrix away from NECA, it'd be straight up Toypocalypse). The reasons fans don't collect Mattel toys are numerous and more complex, but probably one of the most common and simplest reasons is that the figures are just difficult to obtain. Despite being a mass-market toy company (eternally #2 behind Hasbro [in the boys' lines, at least --ed. ]), most worthwhile Mattel products don't find their way into brick and mortar stores. They often can only be found online, at Mattel's collector-oriented Website-That-Shall-Not-Be-Named, and if you can manage to snag one of the figures without the website crashing the moment the figure goes on sale, you still have to have enough disposable income to blow $20 + shipping on a figure that logically should be retailing for under $15. Which provides a nice segue into the subject of this review. Mattel's Movie Masters figures, which focus mainly - for the time being - on Christopher Nolan's Batman films, are primarily sold through Mattel's website, but they are also available in real live, honest-to-gosh stores... or at least, one store. Toys Я Us made a deal to continue carrying the Movie Masters line after the buzz for The Dark Knight had died down, and the price is actually semi-reasonable and comparable to other mass-market figures in the same scale. Go figure. 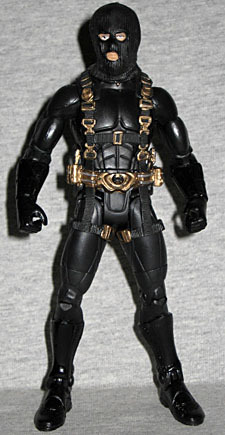 While one figure (Joker as Bank Robber) was available only online, the other figures have all found their way to TRU, including Survival Suit Bruce Wayne. SSBW's look is taken from a scene in Batman Begins when Bruce has yet to perfect his costume, and is just beginning to test the waters of skulking around the underbelly of Gotham City. 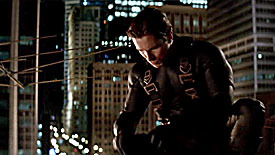 He confronts Commissioner Gordon and proposes an alliance while wearing an outfit made up of prototype Waynetech armor, the gloves he wore while training with the League of Shadows, a ski-mask, and some webgear. Since most of this costume would be directly utilized for the initial Batman costume, the figural version of SSBW is - you guessed it - chock full of that good ol' Mattel re-use. It makes sense though, and is ultimately accurate to the way the character appeared onscreen. Everything but the figure's new head and re-tooled upper torso is re-used from the Movie Masters Batman figure (Begins version, not this one), but it's the Four Horsemen, so you know it's done well. Wait, did I say new head? 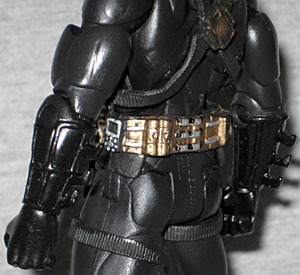 I meant the head originally used on the unmasked "chase" variant of the Movie Masters Batman figure. Under the figure's ski mask you'll find a very nice miniature version of Christian Bale's handsome visage. It's very recognizable, and the 4H did a great job of capturing Bale's likeness. It's rather smooth and not overly detailed, but I'm hard-pressed to think of another figure in this scale that has nailed an actor's likeness so well (the only figure that comes to mind is NECA's Terminator 2 T-1000 figure). Bale's sharp features, determined and furrowed brow, his hawkish nose... all top-notch. The head pops off the body easily enough, which means you can actually construct the chase Batman figure if you own SSBW and the normal costumed Bats. What you can't do, or at least what you can't do quite so easily, is stick this head on Movie Masters Harvey Dent and create your own highly-articulated Patrick Bateman (of American Psycho fame) figure. Harvey's neck peg is thicker, so unless you wanna switch neck pegs, you're limited in your head-swapping options. I suppose that would also have been a good opportunity to make a standard Bruce Wayne figure, but with Mattel already having a generic "guy-in-a-suit" sculpt and a Bale head, you can bet there's a suited Bruce on the docket in their near future. The rest of the body is well-sculpted if simple. The Begins batsuit is far less complex than the upgraded version seen in The Dark Knight, so the simplification makes sense. Much of the detail is in the gloves and boots, and other than some warping on the spikes on his gloves, everything is looking pretty good. His webgear is a separate piece, but it's not removable. The straps have a hatched pattern, and there are clasps and buckles all over the place. 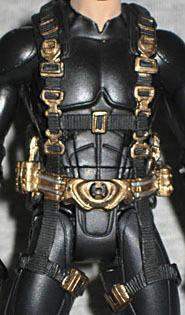 The utility belt is part of the webgear sculpt, and it's also nicely detailed. I mentioned the warping on the gloves, and on my figure that extends to the rest of the arm as well. While much of the problem can be hidden when in an "action pose", when both arms are at rest it becomes clear that one arm is straight and the other has a pronounced bend in it. Plastic quality is an issue that comes up in Mattel figures constantly, and I'm really glad I didn't pay online prices for this guy, because the quality just does not support such a premium. Paint is simple, but effective. He's mostly molded in flat black plastic, with gloss applied to his boots and gloves. While his head is molded in Caucasian flesh tone, his neck is painted and there's an ugly seam that runs down both sides of it. 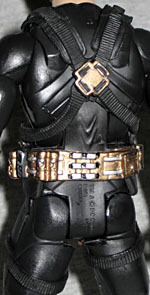 The harness is black with gold and silver used on the belt and buckles, and its here that most of the slop is found. None of it is bad, but like the plastic quality issues, how much you pay is likely to influence how much it affects your opinion of the figure. 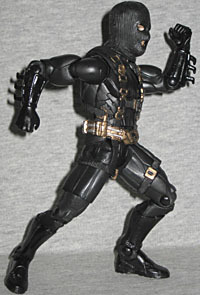 The figure gets the standard Mattel articulation, which is quite extensive and doesn't do much to interrupt the sculpt. Bruce has a balljointed neck and shoulders, peg biceps, hinged elbows, peg wrists, a hinged chest, a peg waist, peg-and-hinge hips, peg thighs, hinged knees, and hinged ankles. All of the joints are tight and smooth, although the weakness of the plastic meant that freezer time was required for the initial freeing of some of the joints. SSBW gets two accessories, although it's really just the same accessory twice. It's a removable rubber ski-mask, and he gets two: one that actually fits on his head, and a scaled up "evidence" version that is exactly the same sculpt including the split up the back that allows it to stretch over a figure's head. However, it seems that the larger version is just a smidge too small for a 1/6 scale figure, so it's really kind of useless. The smaller balaclava fits on the figure about as well as it can in this scale, though it looks pretty bulbous and I prefer to display SSBW without it. Who wants to hide that great likeness anyway? Survival Suit Bruce Wayne is your typical Mattel figure: good sculpt of a solid license, with a few foibles in the quality and accessories department that keep it from really being great. If you come across this figure at a TRU without too much trouble, it's a decent value, but if you ordered it from Mattel (back when it was in stock - remember, to Mattel a figure is a "failure" if it remains "in stock" for any real amount of time) then your mileage may vary.